In a recent contract signing with Boston Dynamics, DARPA has made a multi-million dollar investment in the soldier of the future's best friend - BigDog, the robotic carryall. The problem? Today's soldiers carry a lot of weight; they need something that can follow them across difficult terrain. William Gibson, in a more recent novel, wrote about a slamhound robotic dog, that had a similar kind of robot, but with a deadlier payload. Additional references: Mobile Robots take Baby Steps, Boston Dynamics BigDog Robot and The Next Step - Walking Robots. 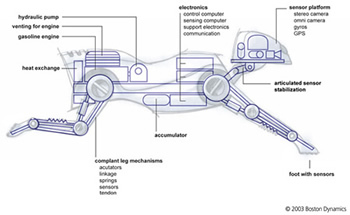 Update 22-Mar-2005: Check their progress; read DARPA's BigDog Now In Puppy Stage.